The Carver Cup enjoyed a fitting finale to the 80thanniversary of the club’s return to Newbridge with two exciting finals bringing the tournament to an end. Out of the 32 entries to this year’s competition, four were left standing as the Plate and Main Finals took place in front of an appreciative crowd at the club on Wednesday night. First up in the Plate, Dave Bassett had an advantage in the handicap against Steve Giddings, but still needed to deliver on the night, and did well to get out in front and hold off a potential fightback to claim a deserved 3-1 win. Then it was time for the main event, literally, with the main final between Beth Grinsell and Simon Newell. A rollercoaster first game saw Simon eventually prevail 11-10, but from there Beth managed to take control to win the following three games and ensure her name would be added to the prestigious Winners’ Board for the tournament. 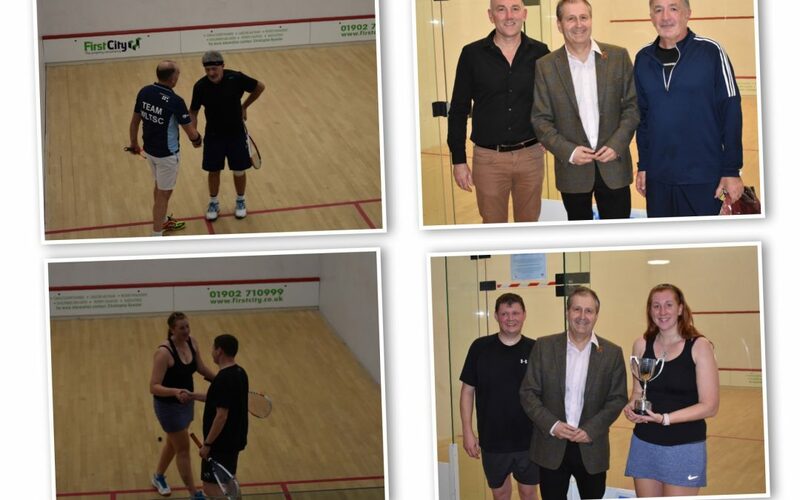 Thanks must go to Carvers for sponsoring the tournament, with Henry Carver among the spectators at the finals before making the presentations along with Squash Chairman Guy Birkett to the winners and runners-up. Also to Chris Dawson and Andy Hepworth for their organisation, and to Chris and Rod Willetts, for their umpiring on the night. Well done to Beth and Dave! The next tournament is the age group squash vets and vintage.